There’s a walk that occurs each year in October. A mass migration of people from all across the suburbs to meet at a certain point, at a set time, on that day to walk together as one community. Their aim is to welcome the many who’ve come across the seas to call Australia home. 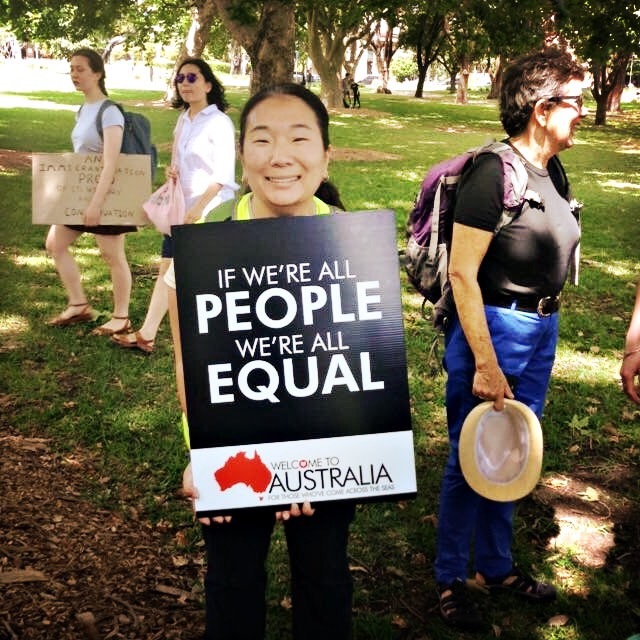 To help create a welcoming and inclusive Australia. They say it’s a celebration of diversity, a declaration that we can be a community, a nation, that is known for its compassion and generosity. For me, its message is one of love. Love that looks to care for the isolated and different. That embraces those who have escaped their homeland with their lives, fleeing war and persecution. In a world where the voices of the alt-right are gaining prominence, where people are keen to exclude and vilify others for their difference, this walk is needed. Every single participant is there to say refugees, asylum seekers and new migrants are welcome here. So many people, showing up in their thousands, to say people matter. That despite our outward appearances, we are all equal and valued. I’ve walked with them a few times and am hoping to do so again this year. I hate marching. I’m not a natural. It’s uncomfortable and I feel shy. But while I feel awkward, I know my voice will contribute to something bigger than myself. The process of settlement is difficult. It is hard to put down roots in a country and to make it your home. My prayer every year is that those who have come to this place and have started that process, will see the mass of people walking that day and take heart. It is a march for them. And it carries our hopes that they will one day love this place and its people as much as we do. Every time they meet disappointments or petty cruelties, I hope they hear our voices, see our signs and know they belong here. I hope they will know there are people from every corner of this country who want to help them and wish them every happiness in their new home. Well-written post. As an American, it is interesting to see how this issue is playing out in other countries. Thank you Lauren. I wonder if there are more similarities than we think. Thank you for stopping by everydaystrange and for your encouragement!